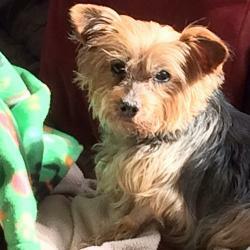 Sadly sweet Payton crossed the bridge on September 7 due to complications from diabetes care. Little Payton began seizures which could only be stopped by placing him into an anesthetic like coma. He was deemed to have neurological deficits that were to great for him to have any quality of life and we had to make the difficult decision to let him go. Rest in peace sweet boy; you were much loved. Poor Pepe came to us with multiple large tumors. He had the surgery to remove them this week. He did well immediately after surgery but soon afterwards he began a downhill slide and was never able to leave the hospital. Today his kidneys and liver failed and the prognosis for recovery was very slim so the difficult decision to let Pepe go was made. Run free over the bridge sweet Pepe. We loved you and tried our best to save you but sadly it was too late. 4/28/16 Little Teeka crossed over the Rainbow Bridge today. Her trachea unexpectedly collapsed completely. Teeka and her foster dad were on their way home from a vet visit when it happened. Her foster dad rushed her back to the vet where they said her trachea was 100% collapsed. There were few options and none that could guarantee she would have any quality of life. Sadly the decision was made to help her cross the bridge. Her foster dad will miss little Teeka greatly. She will always be remembered in his heart and by those of us in UYR who, after her ear surgery, had such hope for this sweet girl. On April 8, 2016 Today we lost sweet little Peanut who had congestive heart failure and dementia. 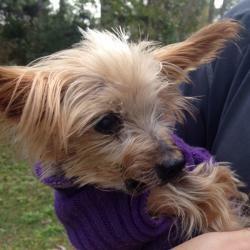 Peanut crossed the rainbow bridge surrounded by his foster mom and volunteers from UYR. 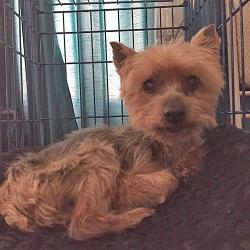 Peanut was a 10-year-old fellow who came to UYR back in January 2016 after being turned into the shelter as a stray. It was believed he had been wandering the streets for some time because when he was found his eyes were matted shut and he was very underweight. 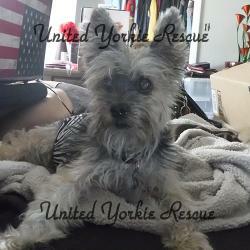 UYR stepped up to help him, He was a small, mild-mannered senior guy who needed help. We immediately got him on a high caloric and supplement infused diet, two rounds of antibiotics to clear up a respiratory infection, as a well as two rounds of medication to address a heavy case of tapeworm. Once those issues were resolved, Peanut was feeling much better, put on a tiny bit of weight, and started to show some more life and interest in his environment. 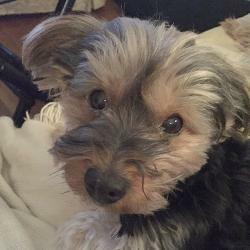 We learned that Peanut had a heart condition and after a cardiology exam, he seemed to be stable and ready for a dental cleaning to continue addressing his overall health. 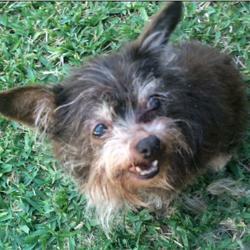 Following his dental we believed that Peanut was on the right track to a better future. However, he started exhibiting new behaviors that quickly increased in the weeks that followed. Peanut was circling occasionally and seemed to take some time to find a comfortable spot to rest, we believed it was because he had sustained some form of injury to his back in the past and that he had residual discomfort, however as time went on the circling increased as well as a level of agitation. His bladder control started to decrease. Unfortunately, he also started to have coughing spells at night once he was resting, which may have been related to the way he was resting and how it impacted his trachea or heart. UYR's volunteers did everything possible to improve Peanut's quality of life, but sadly there was nothing more that could be done. Poor Peanut was just progressively failing at a rapid pace. Although he was only with UYR for a few months, he was given lots of good food, warmth, love, and attention. He knew that up until his last minutes UYR's volunteers had his best intentions in mind and put his needs first. We will miss "Mr. Peanut" and know that he will be waiting at the bridge for his foster mommies one day. Rest in peace sweet boy. 3/30/16 Today sweet AJ went to the Bridge after losing his battle with end-stage renal failure. This is what his foster mom had to say. 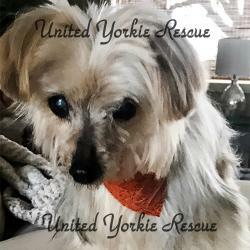 In January of this year, we were asked by the Maltese Rescue of California if we could take AJ in. We agreed and he became my foster baby. AJ was blind and 15 years old. 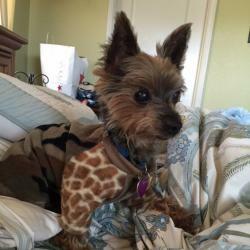 His owner dumped him at a high kill shelter back in September, one day after his 15th birthday. He said that he was getting too old. When we did a senior panel on him he was diagnosed with beginning stage renal disease. AJ did really well at first and I was hopeful I would get to spend at least another year with him but suddenly he wasn't doing so well. He came down with a UTI and although he was treated, he never fully recovered afterwards. We have been in and out of the vet ever since. He got iv fluids at the office, did better and we decided to put him on sub Q fluids at home. When I came home yesterday afternoon I noticed that he was very lethargic as I held him and cuddled with him. He refused all food, only drank water. I knew he was going to leave me. He slept in my arm for most of the night. When I took him to the vet this morning we made the difficult decision to let him go and help him to cross over the Bridge. He was in my arm, cuddled in his Payer Blanket when he took his last breath. I told him how much I loved him and how much I will miss him. I held him for a very long time after he was gone. Eventually I had to let go. RIP my "Little Old Man" as I called you. You are taking a peace of my heart. I love you so much and always will. You will never be forgotten. I am so happy for the time I was able to spend with AJ. I wish he would have come to me sooner. He was the sweetest little dog I have ever known. Little Jamie became suddenly very ill yesterday and was taken to the ER by her foster Mom. 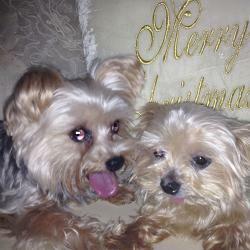 Jamie was diagnosed with severe bacterial gastroenteritis and protein losing gastroenteropathy. We tried to get her through this but sadly little Jamie's system was too weak to fight and she kept losing ground. 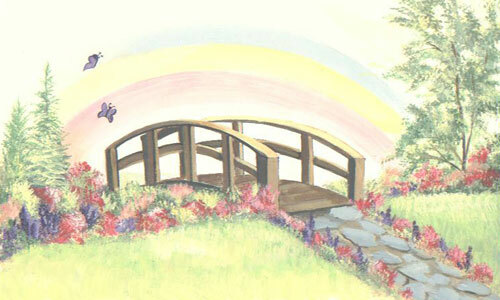 With much sadness we had to help Jamie cross the bridge early this morning. She passed peacefully in the loving arms of her foster mom and has now been released from her suffering. 3/22/16 Sadly little Opal crossed the Rainbow Bridge early this morning. She stopped eating and was taken to the vet where an xray showed she had lung issues. She was rushed to the ER where it was determined she had pneumonia. She was begun on fluids, antibiotics and kept in an oxygen cage, but she succumbed early this morning from her infection. Rest in Peace precious Opal. Your foster mom loved you briefly but very much. 3/14/16 Coco began having seizures and refused to eat much. She received phenobarbital to help with the seizures and foster mom was feeding her whatever she would take from her hand, but Coco's appetite was failing. Coco passed away at 10:45 PM on March 14th in the arms of her foster mom as she was giving her nightly kisses. 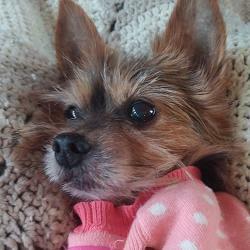 Coco will forever be in the hearts of her first foster mom and her final foster mom and dad. She is finally free from the cancer that was spreading in her body. Rest in Peace little Coco. On March 8, 2016 I lost the best little boy that could ever have entered my life. I adopted him from UYR in January 2004 and had 12 wonderful years with him. He was more than a companion animal...he was my 4-legged friend who knew what I was thinking and was always there to comfort me. He succumbed to chronic pancreatitis which became difficult to manage with his diabetes. Finally, with failing kidneys, he couldn't survive without being on IV fluids. I brought him home from the hospital so we could spend some loving time together before I had to make that last visit to my vet. I will love him always and never forget his sweet kisses and his eyes which were windows into his soul. RIP my Buddy...till we meet again. It is with a very heavy heart that I must share that poor Chance lost his battle with end stage kidney disease early this morning. He fought hard but in the end he simply could not pull out of his downward spiral. He was with us a short time but thanks to his foster family and all of his supporters sweet senior Chance received the very best care and was surrounding by love during his final days. Rest in peace sweet Chance and run free and whole across the Rainbow Bridge. 2/7/16 Last night our Forever Ours boy Henri passed away peacefully in his sleep. He had shown no sign of being sick, he ate his dinner with his usual enthusiasm last night and slept next to his best buddy. Joel and I are so blessed for the time that we had with him. He was such a joy, very much loved and will be missed. On February 3, 2016 I said goodbye to my precious Vanessa who was with me since August 2011 and who despite all her illness was the best girl ever. I know I did my best to give her a good life and loved her more than anyone possibly could. Rest in peace Vanessa and run free and healthy again. You will always be in my heart. Sadly on 1/27/16, sweet Cleo had to be helped to the Bridge. Her kidneys declined quite rapidly and although she might have been hospitalized for fluids and support, the remedy would have been very short lived and she would be back in the hospital. Her little body was giving up the fight, so to save her suffering, her foster mom helped her to the Bridge today. Her foster mom was honored to give Cleo a home and so much love the last 10 months of her life, and Cleo won the hearts of everyone who met her during her time with UYR with her fighting spirit and spunky personality. Run free little Cleo and be healthy once again. On 1/15/14 precious Nora came into my life, very sick and barely alive. 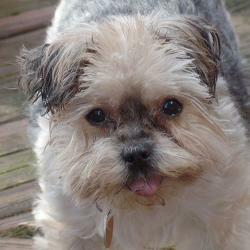 Nora had spent the first 10+ years of her life in a puppy mill. 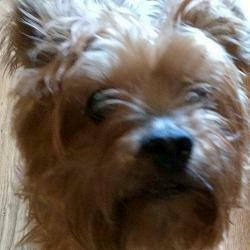 She fought kidney disease, a heart murmur, loss of her left eye, arthritis and about 6 months ago became deaf and blind. I carried her around most of the time after that. She was the light in my life…imagine all those issues and she always had plenty of kisses and love to give me. She was always happy when I or anyone picked her up; she was a lap dog, she slept with me under the covers; I don't know how she could breathe but she had to be as close to me as she could get. 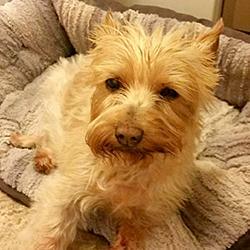 Her arthritis in her left front leg was so bad that she would hop and run on 3 legs. She loved laying in the sunlight and my 9 year old grandson Jaden claimed her as his favorite of all my dogs and she knew it. Nora was known to my daughter as Nora Noodle and everyone loved her. On 1/15/16 exactly 2 years from the day I picked her up in Jacksonville, I helped to cross the Rainbow Bridge. She passed quietly and peacefully in my arms, with her Auntie Judy by our side to help us get thru. She leaves a huge whole in my heart and a deafening silence in my life, but it's hard to imagine a small little 3 pound ball of fire could have had such an impact on so many. RIP my Nora, I will always love you. Zeus 12/24/15 RIP Zeus was a tough little warrior. When he came to us his first vet visit ended with a diagnosis of a severe collapsed trachea, and his prognosis was not very good. But he showed everyone how strong he was. He beat the odds for over a year. During that time he elicited many smiles and happy faces from people who got to know him. He was definitely a Mama's boy and will be sadly missed by his Foster Family and Brother, Bubba. Zeus crossed over the Rainbow Bridge at the age of 16. RIP little guy. You were very loved. 8/17/15 Sweet Pea was just like her name. Very sweet. 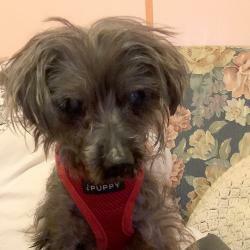 She was 12 years old and weighed not quite 5 pounds when she came into rescue. During the time of her foster care, she had difficulty gaining and retaining weight and she died suddenly before we could identify what was wrong. We miss this little sweetheart and know she is happy and healthy at the Rainbow Bridge. On 6/24/15 Gibbs had surgery to repair the fistula that was linking his bladder and bowel. The doctors felt all was successful and he was recovering, however on 6/27, the doctors noticed Gibbs incision was leaking stool. Evidently his sutures failed and although we were prepared to do another surgery to repair it, he declined very rapidly. Sadly the only thing we could do was help him to the Rainbow Bridge. 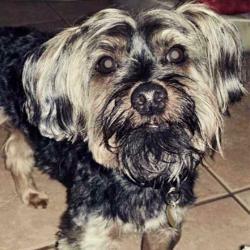 Gibbs' foster mom held him, so he knew to the end, he was very much loved. Gibbs, we will never ever forget you. So many people were praying for your recovery so that you could go on and have a wonderful, happy and healthy life. 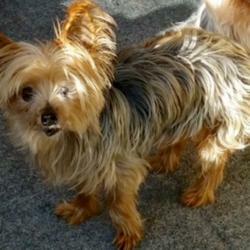 But God had other plans and needed another four-legged little yorkie in Heaven, and He chose You, Little Man. Update 6/12/15 Bailey was seen today because he hadn't been eating well for the past day or so. He was due for a dental so his foster mom brought him to the vet for an exam prior to his surgery. The vet had a difficult time opening Bailey's mouth. She had to place an IV catheter and sedate him prior to exam. Sadly, upon examination, the vet found that Bailey has many lobular lesions in the back of his throat that extended from his teeth down to his trachea. In fact, the veterinary technician had a difficult time placing a breathing tube. The mass is so extensive and delicate that taking a sample of it would cause bleeding into his airway. The vet believes this is a squamous cell carcinoma. It cannot be removed due to the extensive size and location. 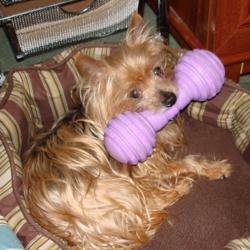 She says that even with steroids, Bailey probably has less than two weeks to live. Poor little Bailey's quality of life diminished so quickly and he was in such pain, we had to make the decision to let him go to the bridge. His foster mom and dad were with him at the time so he knew he was a loved little boy to the end. 5/14/15 It is with a broken heart that I have to share the news of Little Peanut's passing. 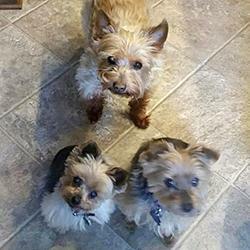 Little Peanut came to United Yorkie Rescue for a loving home with one other fur-brother who loved to play. 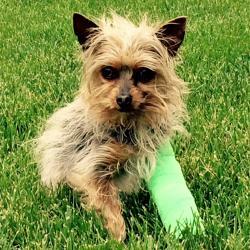 During their play, Little Peanut fell off of a low ramp and fractured his leg. Because they wanted him to have the best possible chance for having a healthy pain-free life, his family contacted UYR for help. When I first met Little Peanut, I instantly fell in love with his cute little face. After a trip to the vet for a splint and perfect blood levels, we were finally headed home. By the time we got there, he had wiggled his way on to my lap where he spent the rest of the night. We had a wonderful Mother's Day where Peanut gave everyone kisses! I dropped him off early on Wednesday and heard later that he was scheduled for surgery later in the day. The report was that surgery went well and he should be ready to go home the next day. Supposedly he was doing well... Then something went wrong. I got a call early afternoon that They discovered Peanut dead in his cage. I didn't think my heart could break as much as it did with that message. The day was a very difficult one for my family as we began to mourn the loss of a tiny dog that had already meant so much to us. 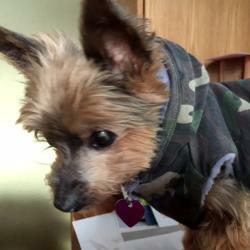 Please give your fur-baby an extra hug in memory of Peanut. He will forever be missed.